Women's hats or womens' hats. This apostrophe worksheet shows where to put those tricky possessive apostrophes in nouns. Replace two-word phrases with the correct contractions in this construction zone. How do you write a possessive noun when you're working with a noun that's already plural? This worksheet covers the basics. Give your students practise shortening phrases into contractions and expanding contractions into phrases. Teach your students how apostrophes show the correct possessive form of a noun with this handy grammar resource! Students will complete eight sentences with words that are missing apostrophes before writing their own sentences. Use this practise worksheet to develop your child's punctuation skills. Students will correct five sentences and rewrite five more using their knowledge of commas, apostrophes, and capitalization. Possessive Nouns: Whose Is It? "The book of the teacher" sounds so clumsy compared to "the teacher's book." This year four writing worksheet shows kids how to make possessive nouns. Help your third grader review and master when to use an apostrophe s in possessives with this printable worksheet. Give students practise shortening phrases into contractions and correctly placing that apostrophe. Challenge your child to to identify compound words, contractions, and abbreviations in a short story. Help your child practise, practise, practise with this spelling sheet that's all about apostrophes. Use this resource with your students to practise forming possessive nouns. They will use context to determine if they need to form a singular or plural possessive. Help your third grader tackle apostrophes with this worksheet that challenges him to add apostrophes to contractions where needed. Young writers can master contractions with this practise worksheet. Try breaking down contractions and then making contractions! 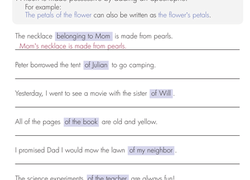 Your students will enjoy this kinesthetic activity as they review the grammar concept of singular and plural possessive nouns. Searching for a worksheet to help your third grader with contractions? This printable is perfect for young readers working on vocabulary skills.